The development of new antimicrobial drugs is a very challenging task owing to the rapidly developing drug resistance among the existing drugs. The hybridization of active and novel compounds is a commonly used approach to combat this situation. The azo linkage (N=N) is successfully used to link two bioactive moieties to enhance the therapeutic effects. The hybrid derivatives linked by azo linkage have shown their activity by acting on target proteins in microorganisms, cell wall inhibitors, DHPS inhibitors, RNA Editing Ligase 1 inhibitors, the general protein secretory (Sec) pathway inhibitors, neuraminidase inhibitors, etc. The current review covers the general enzymes and regulatory pathways in microorganisms targeted by diazenyl compounds and recent developments pertaining to diazenyl derivatives as antimicrobial agents during the last five years. This information will prove useful to the researchers for the development of novel antimicrobial agents by slight modifications in active derivatives with improved activities. Keywords: Antimicrobial, Neuraminidase, Diazenyl, Virulence, Hybridization, RNA. Keywords:Antimicrobial, Neuraminidase, Diazenyl, Virulence, Hybridization, RNA. Abstract:The development of new antimicrobial drugs is a very challenging task owing to the rapidly developing drug resistance among the existing drugs. The hybridization of active and novel compounds is a commonly used approach to combat this situation. The azo linkage (N=N) is successfully used to link two bioactive moieties to enhance the therapeutic effects. The hybrid derivatives linked by azo linkage have shown their activity by acting on target proteins in microorganisms, cell wall inhibitors, DHPS inhibitors, RNA Editing Ligase 1 inhibitors, the general protein secretory (Sec) pathway inhibitors, neuraminidase inhibitors, etc. The current review covers the general enzymes and regulatory pathways in microorganisms targeted by diazenyl compounds and recent developments pertaining to diazenyl derivatives as antimicrobial agents during the last five years. 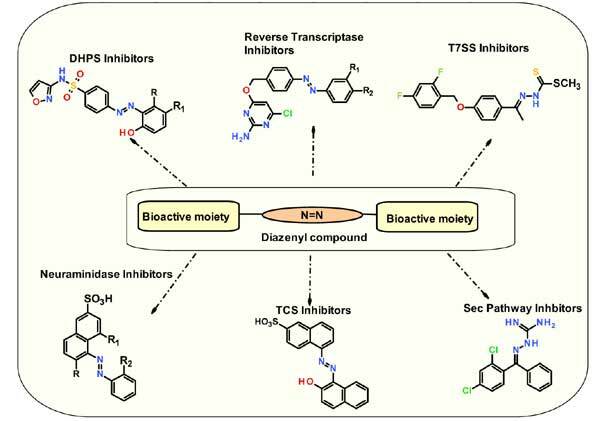 This information will prove useful to the researchers for the development of novel antimicrobial agents by slight modifications in active derivatives with improved activities.